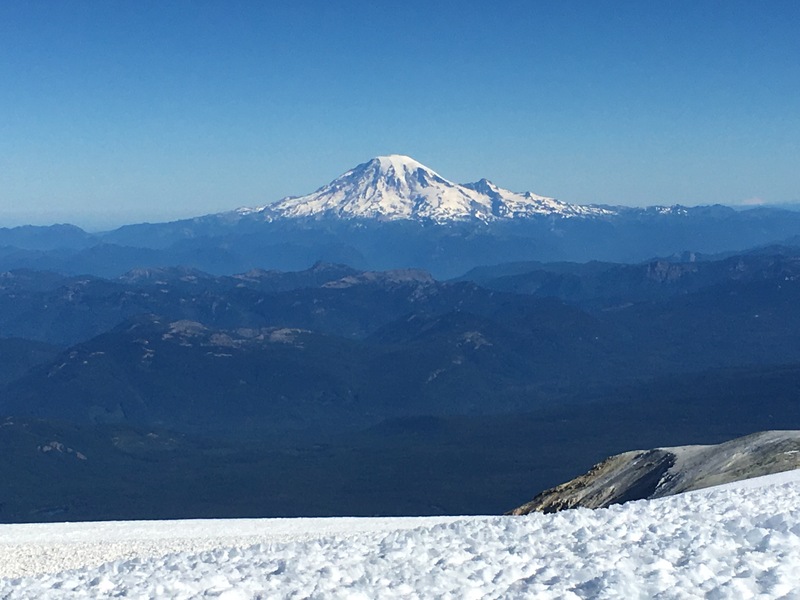 Two posts ago, I shared some lessons learned from the experience of not successfully summiting Washington’s second highest peak, Mt. Adams (see The Lessons of Unsuccess). 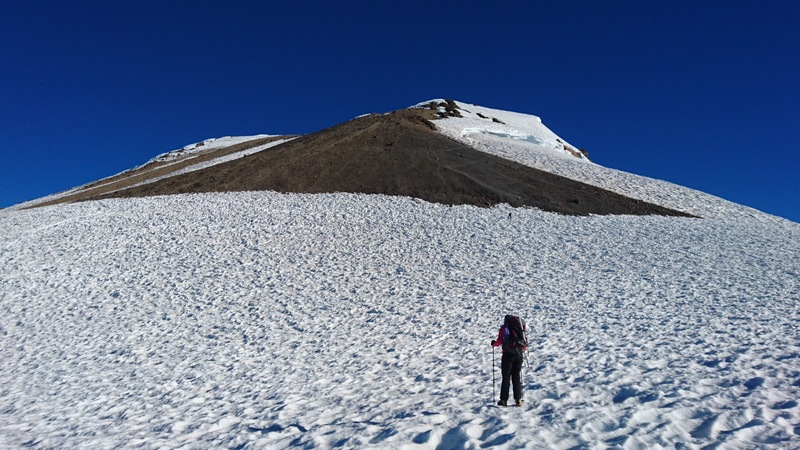 While I learned a lot on that trip, I was eager for a chance to return and see if I could make the summit. Last weekend, I had another chance. 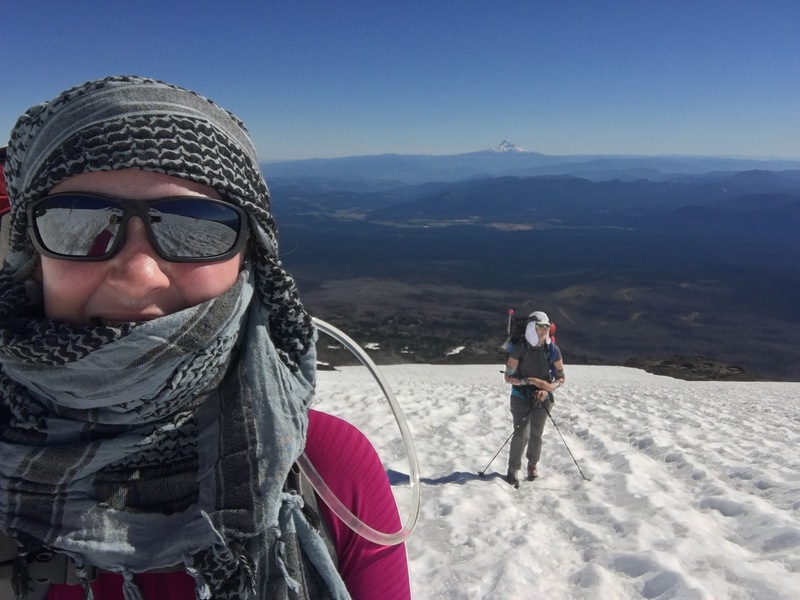 This time with Angela W., a Seattle Mountaineer who I met on the Granite Mountain scramble. In a whirlwind, new gear was acquired, bags repacked, and it was off to Trout Lake for a second attempt. 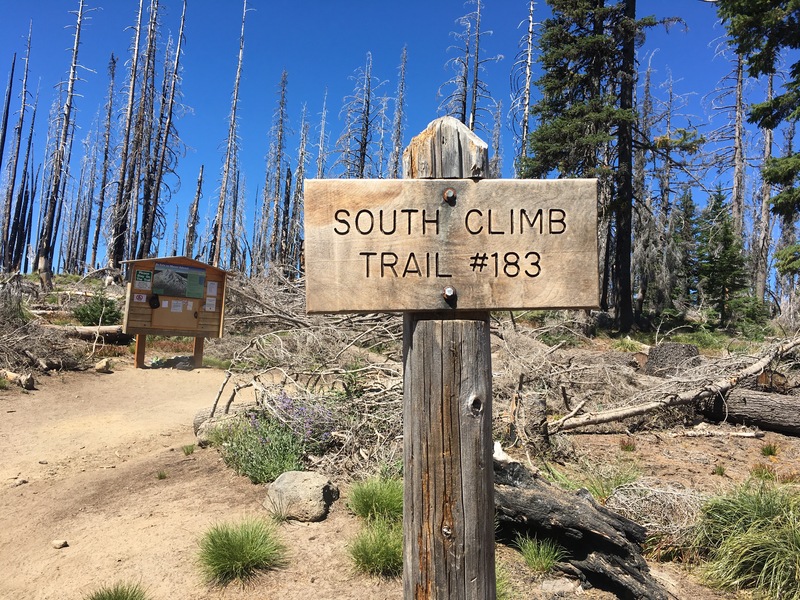 We rendezvoused at 10:30 a.m. Sunday, picked up permits, and set off to the trailhead in good time. 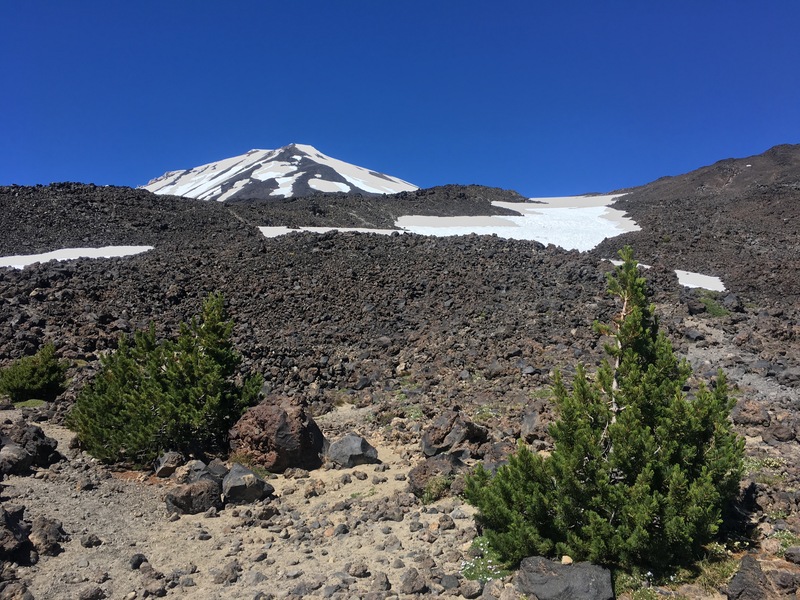 By 11:40 were were booted up and on the dusty path, Angela for the first time, and me with a growing sense of familiarity to the landmarks and majestic views of the volcano ahead of us. The amount of snowmelt between two weeks prior and now was remarkable! The area James and Kris had used snowshoes was now a dirt trail with a flowing stream where we stopped to filter water. 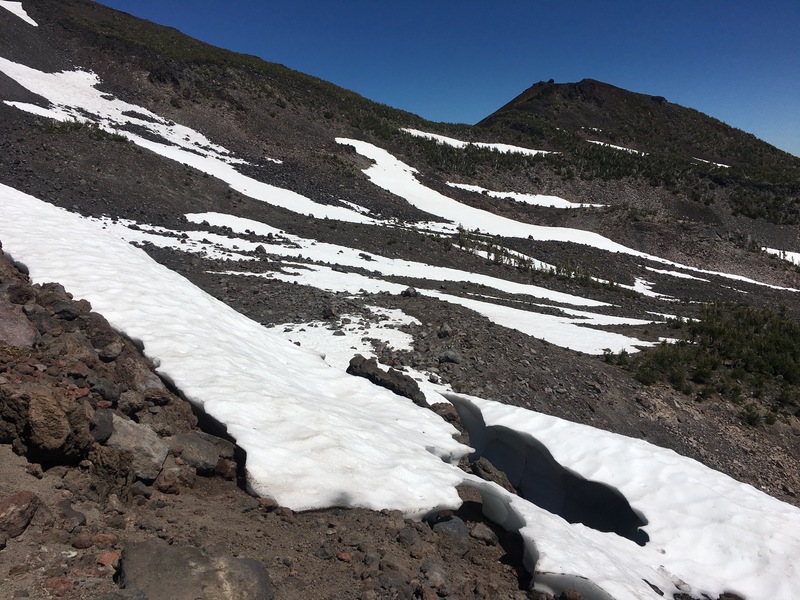 The snowfields we had so easily traversed had given way to what was now clearly a glacier (Crescent Glacier) and the summer route that Dustin and I had debated over tirelessly last time was now clearly defined as up to the ridge and through the rocky landscape. Conditions change constantly in the mountains, especially where snow is concerned. In the beating sun and afternoon heat, I made good use of my new acquisition, a shemagh. Having seen Dustin wearing it last time and knowing that I needed to do a better job of protecting my skin, I had ordered one online and was curious as to how it would work. 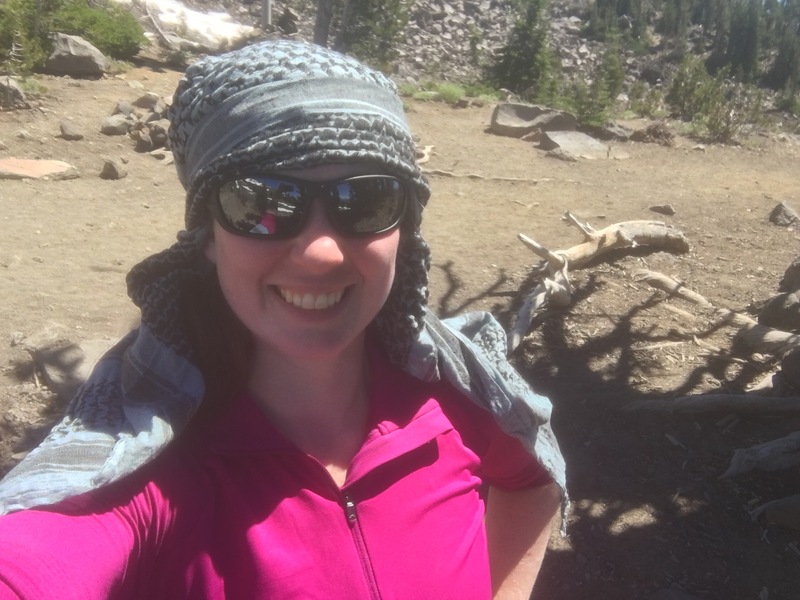 As we worked our way up the rocks and back onto the snow towards the Lunch Counter (LC), I quickly fell in love with the comfortable, breathable material, and found all kinds of ways to use it to protect me from the sun. 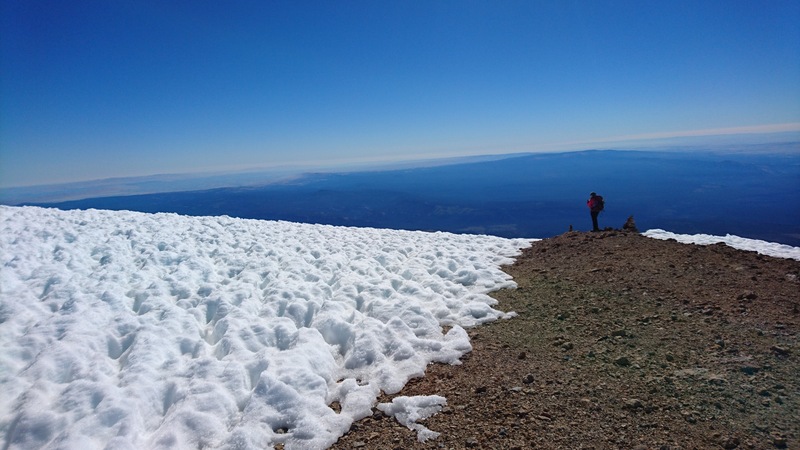 We trekked up the softening snow and reached the bottom of LC at approximately 4:45 p.m. and pressed on, wanting to camp above 9,000′ so Angela could see how she does at altitude. Other climbers seemed to be pulling off earlier than us, opting to carry their gear less that evening and make up the distance with lighter packs in the morning. The result was that we ended up with our choice of spots and our chosen area seemingly all to ourselves. My first priority was water, after getting impacted by a lack thereof last time. 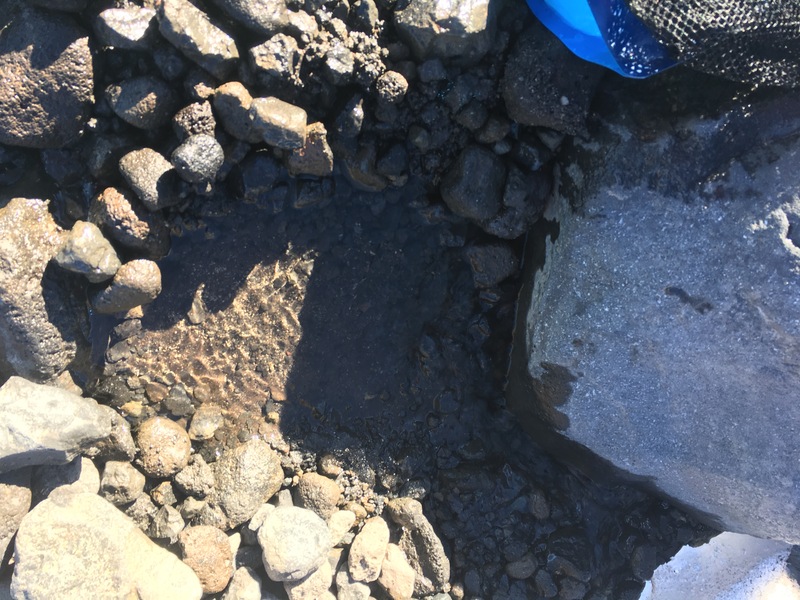 Near our site was a trickle of snowmelt and I was able to build a small pool and fill and filter enough water to replenish the hydration packs and have some extra for camp. Let it be noted that even though the night did not drop below freezing and the sun was bright both days, on our descent the trickle had stopped and there was no source of water outside of melting snow until we returned to the creek further down. Never take anything for granted in the mountains. Our evening was spent admiring the views, playing with a beach ball Angela had brought, and watching the sunset. As opposed to last time, there was barely a breath of wind, and the absolute silence was amazing. After a restless night (neither of us slept well, more of a long term doze for both of us), it was 3:45 a.m and time to get up and moving. We were on the snow somewhere around 4:40 a.m., beginning the climb to the false summit, Piker’s Peak, with crampons on and iceaxes out right around 5 a.m. The snow was solid and slick, not something I would recommend attempting without gear. As we climbed, we could see the headlamps of other climbers waking up and getting ready down at LC. We also saw a solo climber, Kason, who had started from the parking lot around 1:45 a.m. and was doing a single-day ascent. He passed us up Piker’s and we leapfrogged with him the rest of the way, sharing encoragenements back and forth as we all pressed on for the sky. We reached the top of Piker’s Peak around 7:15 a.m. Two hours was about what we had anticipated for this stretch, and we enjoyed a break before taking on the final climb. From the false summit, it truly looked like someone had taken a mountain and plopped it on top of the mountain we had just climbed. I can see how disheartening it would be if you didn’t read up on Mt. Adams beforehand and expected an easy summit after making it this far. 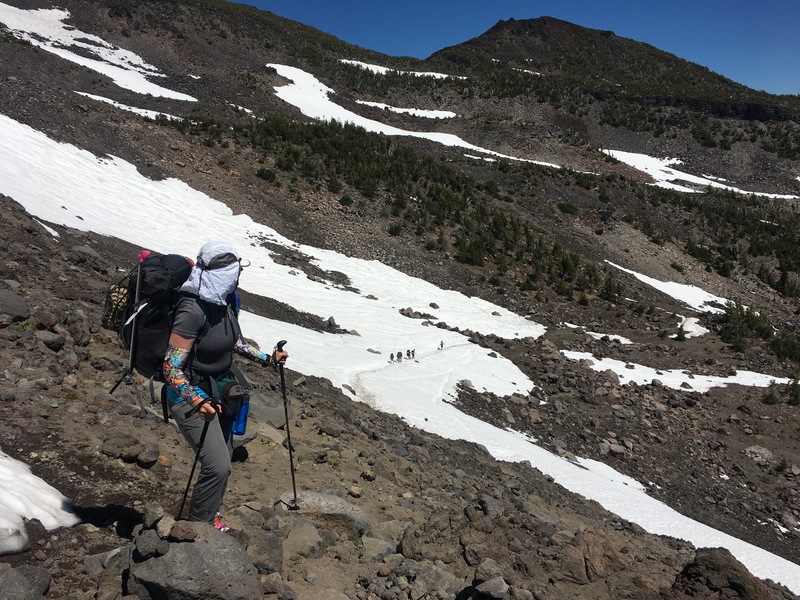 The bootpath led to a final snowclimb, whereas switchbacks in the rocky scree showed us another option, though perhaps somewhat less traveled. I had no preference and ahead of us we could see Kason taking on the rocky path. 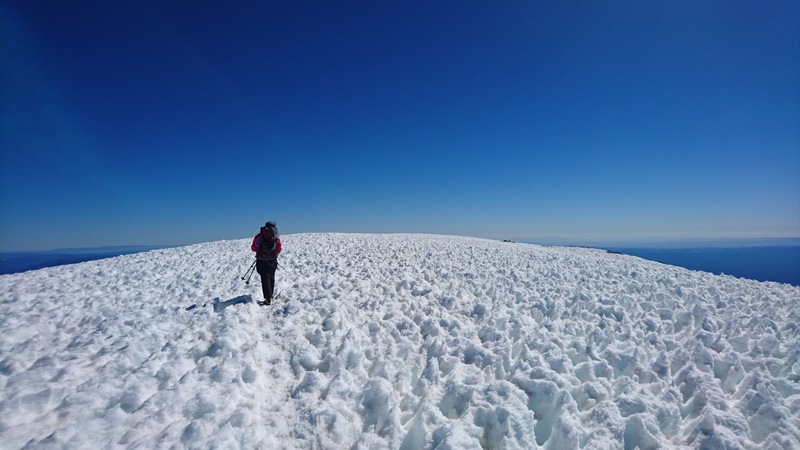 After conferring with Angela, we decided to take the scree, a decision that worked fine for us an offered amazing views of the cornices and crevasses off the southeast side of the mountain, but perhaps not the route I would choose again. When we were on snow, it was amazing to look at the contours, the wind and sun having sculpted the snow into amazing patterns and frozen waves. It felt like stepping across a frozen ocean and was mesmerizing to behold. As we got higher, these troughs (also known as sun cups) became more defined, and on our final break before the summit, I was able to sit down inside one to show the size. One final push for the summit remained! By now, Kason had made it and there were other climbers close behind. We pushed on and before we knew it, we reached the top with breathtaking views of Mt. Rainier and Mt. Baker to the north, the first time we had seen these familiar neighbors since entering the Mt. Adams Wilderness. A few more steps and we were at the true summit (12,276′) at approximatley 9:10 a.m. So, a total of 4.5 hours from LC to summit with several rests and breaks, not bad! My highest peak yet and an even sweeter accomplishment after having to turn back before. Never has a summit felt so good! We walked across the frozen sea to the east side of the mountain and looked out at the areas that seemed to be Yakima and the Tri-Cities. I remembered seeing Mt. Adams from the road the last time I had been in Yakima, when I hadn’t even considered the possibility of standing on top of her one day, and it struck me again how far I have come in this mountaineering world in barely a year. So many blessings. Such a gift to live this life. Soon it was time to descend. Just after 10 a.m. we were geared up and ready to go. We both tried the first glissades and felt the crunch of frozen snow beneath us. 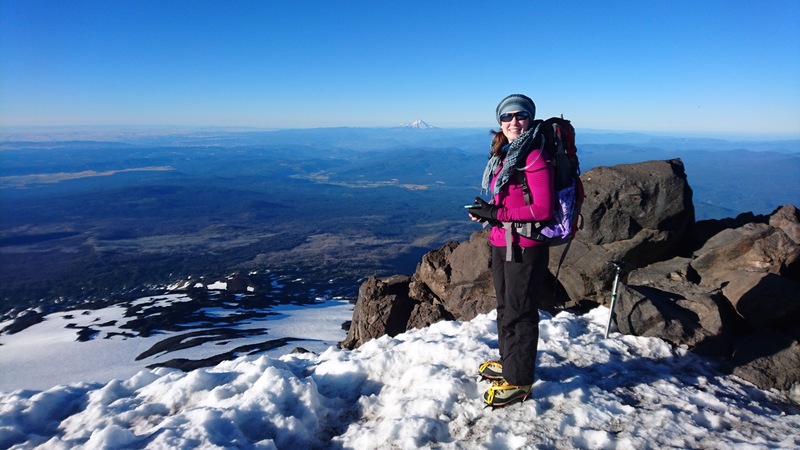 Angela decided it was out of her comfort zone and opted to walk back to LC, using the opportunity to practice more in crampons for future climbs. 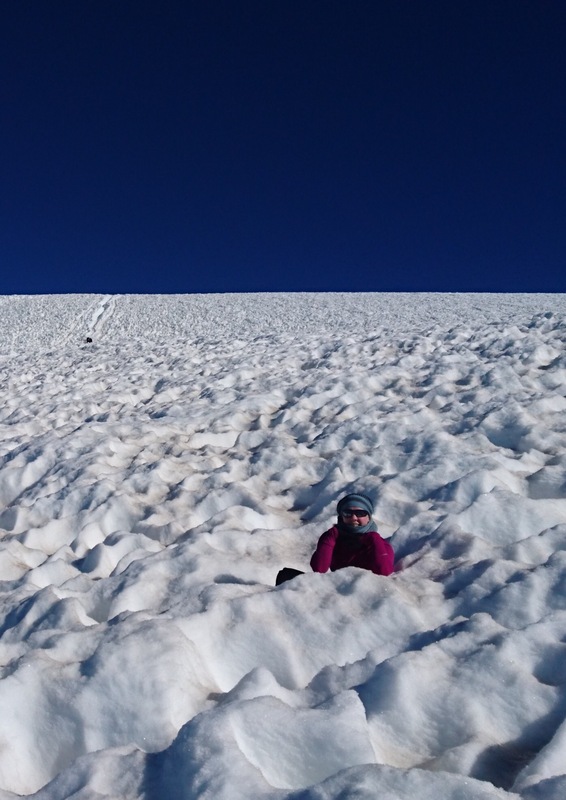 I opted to try out every small chute we came upon and by the time we reached Piker’s, I felt confident enough to take on the whole slide. Knowing the west chute led to rocks (from scouting on the way up), I chose the east chute. The top parts were a little challenging, taking a lot of muscle to dig in the iceaxe and control my descent, and at one point the chute walls were so wide that I found my legs splaying and was worried about a dislocation or fracture should I lose control of my speed. However, with attention and careful application of everything I have learned this year, I was able to slide slowly down the steep spots and enjoyed the rest of my 2,700′ descent in 10-15 minutes. What a ride! I stumbled over to the rocks at upper LC and found some welcome shade where I relaxed and waited for Angela. We made it back to our tents, packed up, and headed down the mountain, happily wishing new climbers good luck and answering questions as best we could. The cold water at the creek crossing was the most delicious thing I have tasted in a long time, and it was gratefully followed by the Mt. Adams Burger at the local cafe back in Trout Lake. The four hour drive back was long and tiring, but the reality set in more with every mile. We had done it! I fell asleep exhausted that night and awoke with elation as it truly, fully set in. We had done it! Every time I push myself past the limits I thought I had, I realize how much more I am capable of. To climbing higher! To truly living! To new adventures to come!